If you're excited about something, you should be able to talk about it. Someone mentioned "spoilers" and Daryl decided he'd had enough. Enough of people saying that their inability to ignore someone saying something about a movie or TV show they claim to want to see is more important than his excitement about that movie or TV show. Daryl started to rant in what has been described as a rant heard by all of Ballard and possibly all of the city of Seattle. For this episode I got on my soapbox about people are tired of the types of movies that are coming out of Hollywood. It may have been incoherent rambling, but have a look & listen then decide. After that I discussed the latest incarnation of Hellboy. I saw it this past weekend and I liked it more than the reviewers seemed to. No, it’s not an amazing team up of DC villain and Marvel hero. 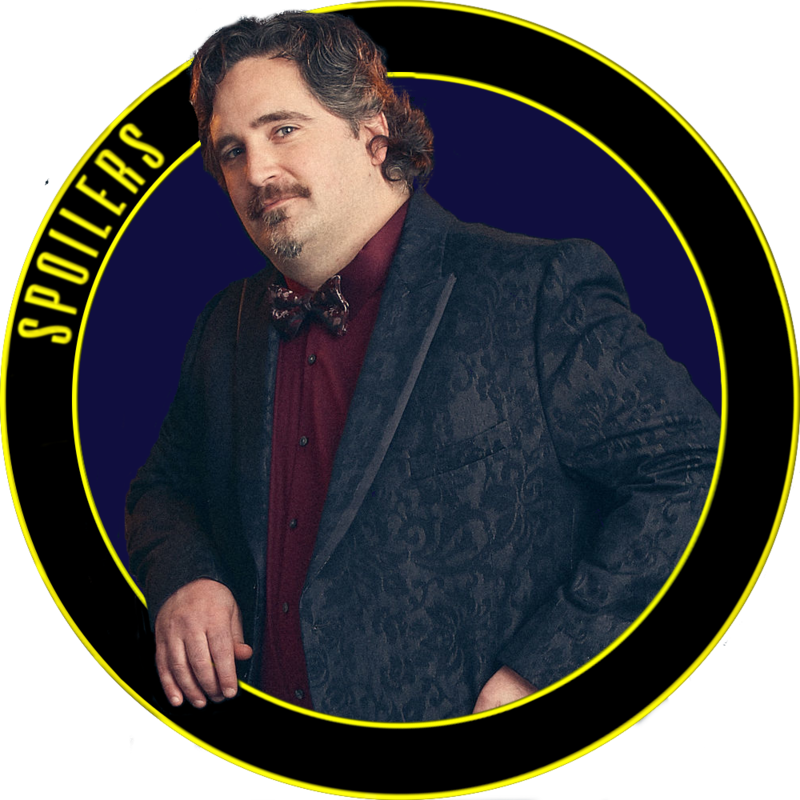 It’s a new episode of The Spoilers with Diacre. Daryl has caught up on the latest episodes of Supergirl and wants to discuss Lex Luthor, as played by Jon Cryer. Also, a different podcast has turned him on the The Unbeatable Squirrel Girl and he has a review for you. Let’s get nuts. It's time for Daryl to go it alone as the WD in our various online accounts now stands for "with Daryl." With that in mind, Daryl just saw Captain Marvel and wanted to talk about every tangent he could find with it. Wayne and I were feeling as if the podcast was not really an expression of who we really are. We decided that our phrase "we talk about what excites us, and what annoys us, without holding back," is a lot larger than what we have been doing. So, we let loose the floodgates and start going without any clue where we'll end up. We end up talking about twitch streaming, Titan Games, and a long segment about comics. So much more than Marvel vs. DC. But what is great about Marvel and where are they going. We moved away from our normal talk about blockbusters this week, as we started the episode discussing “The Wife” starring Glenn Close. It was a tense drama with no special effects, other than Ms. Close’s acting ability. Also outside the blockbusting movies is the YouTube re-release of “The Legend of Neil” Series. A man gets sucked into the Legend of Zelda while playing the game and with himself. You should watch it if you like stupid, crude humor. Not completely leaving big, budget movies behind Wayne and Daryl wrapped up the episode talking about the trailer for “Spiderman: Far From Home.” They had favorite parts. And, Wayne educated us all on the character Mysterio. We start the new year off with a huge episode. Of course we cover the movies we watched at the end of the year. Those being Spiderman: Into The Spiderverse and Aquaman. But we also go through the plethora of movies we saw and/or discussed in 2018. We also picked our top 5 (Endgame excluded) each for 2019. We hit this episode without a plan. So what do a couple of improvisers do? We make it up on the spot. From Daryl doing a bad rendition of “It’s all the way live” to actual discussions about things, we’ve got you covered. It is with a heavy heart that we start this episode having to say good-bye to The Man, Stan Lee. He will be missed, because there is so much to remember. This episode was recorded before we found out the news though. So, we talked about Bohemian Rhapsody. Wayne and Daryl have been excited to see it and Wayne finally did. He weighs in on the good, the bad, the ridiculous. It's halloween time so we get spooky and speak about the death (or at least upcoming death) of Moviepass. We also discuss some other entertainment news. Daryl bit the bullet and got DC Universe so he can discuss Titans. Finally, we go back to the past when Daryl finally watched Scott Pilgrim vs. The World.